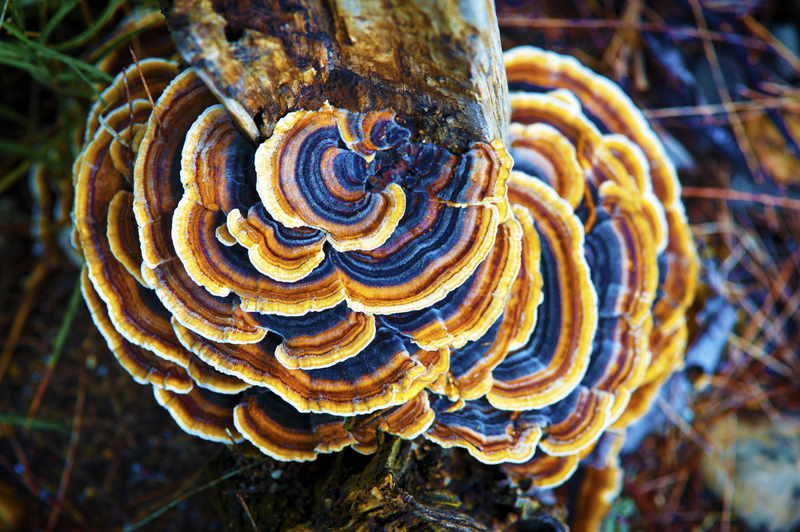 This stock image is believed to be of the genus "Trametes," is a polypore (which refers to the fact that it has underside pores—rather than gills—to release its spores), and is a saprotroph (which means it eats dead material, and is decomposing the wood on which it is fruiting). Now, new species descriptions for fungi typically require both DNA sequences (ideally from several different sections of their DNA) and their morphological descriptions. Estimates vary of how many fungi there are and even how much they must differ from each other to be a separate species. Fungi spend most of their life invisible, buried in their substrate (i.e., food source), which could be a live host like a plant/animal, or dead material/soil. While some make fruit bodies (think mushrooms) annually, others might only do so every few years, and some might never produce anything we can see without a microscope. We used to classify fungi based on what we could see of them (their “morphology”). Imagine that two fungi were about the same color and shape and had similar-looking spores. They likely would have been grouped together for taxonomy purposes based on those observations and other factors such as their biochemistry. Fast forward to today and we can now sample the DNA of these same fungi. It could well be that at the genetic level the two are very different from each other. How these differences are classified can have a huge influence on how many types of fungi we think exist. The question then of how you define a species becomes quite complex. What piece of DNA do you use? How long should it be? How much should one sequence differ from another in order to say you have a new “species”? An article in the American Journal of Botany from 2011 indicated there could be anywhere from one to more than five million species, while an article in Science Daily in 2015 indicated that number is a vast overestimation. A more recent publication (Microbiology Spectrum) published in July of 2017, estimates the number is between 2.2 and 3.8 million. Even scientists don’t currently agree on how many fungi there might be but only about 120,000 of them have been described so far.